Today’s appalling terrorist attacks on two mosques in Christchurch, New Zealand, have been responded to here in the UK with prayers, condemnation, and demonstrations of solidarity with the Muslim community, including at the Friday prayer. As we said after the murderous attack on the Tree of Life Synagogue in Pittsburgh USA last year, attacks on churches, gurdwaras, mosques, temples and other places of worship of different faiths here and around the world are a reminder of the need to condemn extremist violence in the strongest terms and to stand together and to continue to work together with ever greater urgency against ignorance, prejudice and hatred. Hatred targeting any community because of its faith and belief is a scourge that cannot be tolerated. There must be freedom to worship and practise our faith freely and without fear. What’s the use of Faith Groups? Ben Woollard from Together for Sheffield, who commissioned Sheffield’s Faith Action Audit, will talk about it’s findings and what they mean to us. We’ll also look at social action projects carried out by faith groups in Sheffield, from language classes to soup kitchens. Could this inspire us to engage together in local activities? 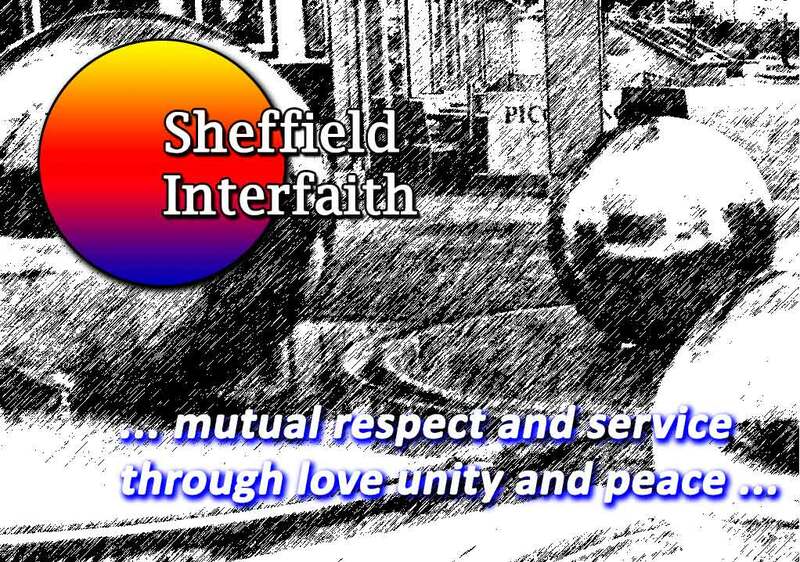 Sheffield Interfaith, founded 1993, consists of local people working together to promote mutual respect and interfaith dialogue in Sheffield. One way to achieve this is by getting to know each other at regular bring-and-share dinners. Why not join us? We welcome newcomers and old friends. Most food is vegetarian. We are marking Interfaith Week at Underbank Unitarian Chapel, Stannington, on November 18th at 11.00 am. Unitarians routinely draw inspiration from the literature of many world faiths and philosophies, and on Interfaith Sunday we have Penny Kaye from the Sheffield Reform Jewish denomination, to give us a talk and to help with some prayers and readings. 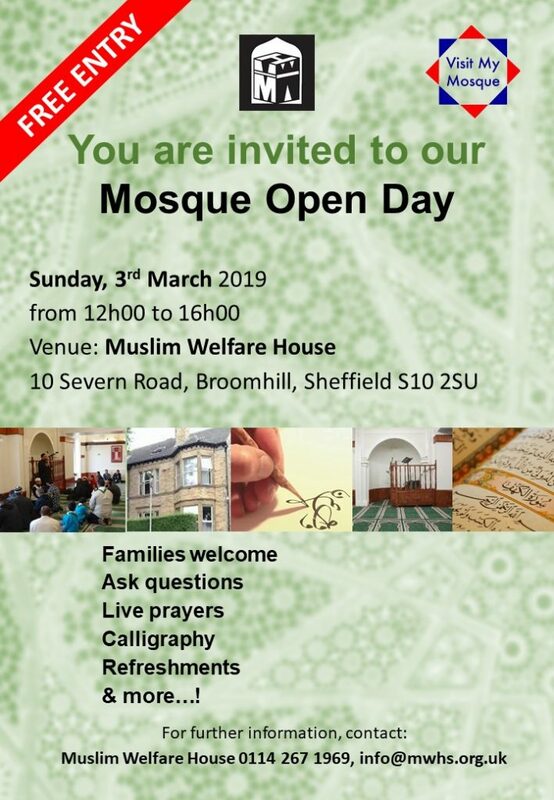 Every month Sheffield Interfaith invite you to join us for a ‘bring & share’ meal, usually at Shirley House Interfaith Centre, 31 Psalter Lane, S11 8YL. Why not come and see? Meet new people and make new friends. People of all faiths (and food traditions), or none, are most welcome. It was suggested at the AGM that it would be a good idea to hold these dinners at other places of worship, so individual faith groups could have contact with Sheffield Interfaith. If your faith group would like to ‘host’ a SIF bring and share meal, please get in touch, via the website. You could use one of these dates or offer a date after February- we try not to clash with religious festivals. For those of us who have more recently become involved in interfaith activities in Sheffield it is very interesting to read about how and why Sheffield Interfaith came into being and some of the people who made it happen. Debjani Chatterjee was involved from before the beginning and wrote this in June 2018. If anyone can remember any names or dates she has forgotten, please get in touch. 11th September 1993, the centenary of the World Parliament of Religions, is officially the date that Sheffield Interfaith (SIF) started. Courtesy of Sheffield City Council, who provided a central venue in the form of the Reception Rooms at Sheffield Town Hall, Sheffield Racial Equality Council (SREC) had called a large public meeting. I became Director of SREC in 1984 and, in the following years, I had tried unsuccessfully to persuade chairpersons that it would be a good thing for us to help set up Sheffield Interfaith. As a Community Relations Council, our role was to promote good community relations. My colleagues and I took up cases of racial discrimination and harassment, and I would give talks on such subjects as the meaning of positive discrimination and the benefits of ethnic monitoring. But I grew increasingly concerned that current race legislation did not address the religious discrimination and harassment that were clearly on the rise as the 1980s progressed. Racial equality could not be promoted on its own, it seemed to me; it had to be part of a larger vision of equal opportunities that embraced gender, disability, sexual orientation, age, class and religion. Religious discrimination could and did affect people of all religions and none. In some instances, as in the case of the exclusion of turbaned Sikhs from certain jobs and buildings, and the desecration of Jewish graves, it was possible to argue that these were both religious and ethnic groups. But no one in community relations could be unaware of the growing tide of Islamophobia in particular, and, it seemed to me, our laws were not addressing this. My own past experience as an RE teacher and my continued involvement in our local Standing Advisory Council on Religious Education (SACRE), confirmed my belief in the importance of public awareness of religious diversity. In nearby places like Bradford, York, and Manchester, I witnessed at firsthand the work of interfaith bodies. Friends would invite me to come and participate in an interfaith walk or attend an interfaith talk, and I was sorry that our city did not have the equivalent. It would be most untrue to say that no interfaith activities had happened in Sheffield, but they had been piecemeal attempts. Some were restricted to specific areas of Sheffield such as Burngreave; while others were limited to creating Christian-Muslim solidarity, or to promoting religious harmony among students. Compared to some parts of the country, Sheffield people were more tolerant and accepting of difference. Nevertheless, we could not be complacent – all prejudice and bigotry needed to be addressed, and we all had a part to play in this. SREC’s Chairperson at that time, Dorothy Dixon-Barrow, agreed that something should be done, but felt strongly that it was not the role of a community relations council to set up an organisation for interfaith dialogue and understanding. I argued that, when a need had been identified, SREC had helped to establish an independent Law Centre in Sheffield. But ‘all community relations councils are secular bodies,’ she said, ‘and that is our strength. While some member organisations are religious bodies, we can’t be supporting the setting up of anything religious.’ Dorothy was a wonderful woman of Jamaican and mixed Jewish heritage; she taught me a lot, and I loved and respected her greatly. But we differed on this matter; I could not persuade her that it was in the interest of community relations that we act as a catalyst and facilitate the setting up of an independent and city-wide body that would be multi-faith and also inclusive of people with humanist or other non-faith beliefs. Dorothy’s successor as Chairperson, a very affable Sri Lankan gentleman, Chandran Owen, thought it unwise to depart from Dorothy’s position. At the same time, I knew that their view was not a general one within the membership at large. There were active members like Hector Franklin, Saleema Imam, Molly Kenyon, Mohammed Nazir and others who would take a different stance. It was a matter of waiting. SIF’S first public event was a great success. I think between 60 and 80 people attended that early evening meeting. A unanimous decision was reached that SIF should continue from then onwards. It would not be affiliated to any church or other religious body, nor to any political group. It would also be independent from SREC and Sheffield City Council, though all were welcome to participate and help. A small SIF committee of no more than half a dozen enthusiasts was set up with SREC’s Chairperson, Haji Mohammed Nazir, as its first Chair. A delightful Bahai couple, Cyrus and Sandra Agahi who ran the Peace Guest House, would try to ensure that one of them came to committee meetings. A very gracious woman from Sheffield’s Brahma Kumaris’ centre was also a regular, as was a bearded gentleman from a Christian-Muslim Dialogue group who bicycled to all our meetings. Dev Dhillon, who represented the Sikh gurdwara on SREC, doubled up on SIF too, though his job in Doncaster made it difficult for him to attend. I was a member of the committee, and our first monthly meetings were held in my office during weekday evenings. Rev Cassandra Howes, who was known universally as Sandra and was Sheffield Hallam University’s Chaplain at the time, had been very active in transforming the Chaplaincy into a multi-faith centre. She became our first and very able Secretary. Soon she too began to host occasional evening meetings. This became very necessary as I left Sheffield for a while to work in Oxfordshire. When it was time for Sandra also to leave Sheffield, SIF gave her a wonderful farewell on 14th February 2002. This was held at Channing Hall, Surrey Street, a city centre venue that was part of Upper Chapel belonging to the Unitarian Churches. Sandra’s successor as SHU’s Chaplain, Ian Maher continued to let us meet at the Multi-faith Chaplaincy, but Rev Geoffrey Ronald Usher from Upper Chapel also offered us space to meet in his church. Geoff, as we all called him was a delightful Australian, a gentle giant with a booming voice who was our Treasurer for many years. The intention was always that our committee would meet regularly and would also organise one or two large events annually, usually at city centre venues, focusing on issues of topical concern to members – events that would be open to all. An example was an interfaith conference that we held on 10th May 1998 from 12.30-6pm at Sheffield Hallam University’s Atrium at Pond Street. Another was a conference that we held at the Central United Reformed Church on Norfolk Street a few years later on the subject of human trafficking and what we in Sheffield could do to help. Refugees, homelessness, discrimination, and ecology, have also – rightly – engaged our members. Sometimes our events would coincide with our AGM and often there would be a celebratory feel to the event with a poetry reading, dancing or songs and music from various faith traditions. On 8th May 2005 SIF’s AGM was held at the Quaker Meeting House. Our speaker was a holocaust survivor and we also had a poetry reading. It was also Geoff Usher’s last AGM as he returned to Australia soon afterwards. There would also be the occasional smaller event, sometimes a multi-faith prayer meeting or a discourse on a topic of interest that was for our members to better understand each other’s traditions and perspectives. John, a very modest elderly Christian on our committee undertook the role of organising visits for members to various places of worship. He would first contact the relevant synagogue, mosque, church, gurdwara or temple to ask if a visit would be welcome and convenient, whether we could join their worship or should observe, and if there would be someone available to guide us and to explain any customs and practices. SIF also organised interfaith walks for peace in Sheffield, in places like Pitsmoor and Netheredge. Sometimes we joined forces with other groups like Burngreave Ashram or Shirley House that were doing good work of an interfaith nature in specific localities. We happily joined with Sheffield City Council in creating an Interfaith forest garden in the Parkwood area, a garden whose maintenance still calls for our voluntary participation. Celebrating National Interfaith Week in Sheffield with meditation, shared food, storytelling, prayers, discussions and readings, etc. has also occupied SIF members from an early date. One of the best things about SIF has been its inclusivity. Members can be from any faith or none. At a time when the national Inter Faith Network would only accept in its membership faith groups that were considered to belong to ‘world religions’, SIF has always had an open-door policy and a determination to be egalitarian. This approach has certainly enriched us, and among our excellent chairs have been Lynn Rishworth, Local Co-ordinator of the Pagan Federation, and a Humanist celebrant, Roy Gordon Sinclair. I had hoped that SIF would apply for funding and then have its own centre, however modest, and paid staff. But in our three decades of existence, this has not been a route taken by SIF. Perhaps that has given us more independence; I think it has also contributed a more informal and perhaps even laid-back style to the organisation. Some of our activities have been picked up and are being done by others, with or without SIF members involved. The energies of a few SIF members have also gone into the Faith Leaders Forum, a government-funded body that was set up by Rev Inderjit Bhogal among others. In recent years, SIF has received a measure of much-needed administrative and technical support from Shirley House Interfaith Centre in the Netheredge area. We now share a website with Shirley House and the Multifaith Chapel & Library of Burngreave Ashram. I see joint activities as helpful and mutually rewarding. SIF’s speakers have usually been from within Sheffield as our city has many inspirational people from all faiths and none. But occasionally, SIF have invited a speaker from outside Sheffield. I recall, for instance, the Muslim who came from Bradford to tell us about his good work there with young people. A highpoint for me was the AGM in which one of our founders, Sandra, was our visiting guest speaker. As I write this, several founder-members have died and others have left the city. Only Haji Nazir and I are still in Sheffield. SIF, like Sheffield itself, has seen many changes. But one constant remains – its members are people who reflect our city’s diversity and vibrancy. Sheffield is the UK’s first City of Sanctuary and its people are not sitting, in Swami Vivekananda’s words, each in their own little well. We know that we are lucky in Sheffield to have the whole world and so many of its ‘wells’ at our doorstep.